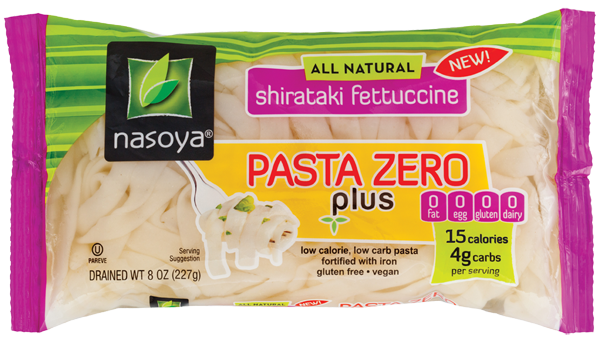 Nasoya brand now makes fortified versions of shirataki. You might be asking yourself what shirataki is. Simply put, it’s noodles made from tofu. What are the benefits of using shirataki versus traditional pasta? Shirataki noodles are low-calorie, low-carb, fat-free and high in fiber. These noodles come wet or dry. I usually buy the wet kind (found in the produce section near the tofu). Preparing wet shirataki is quick and simple. You boil it for a couple of minutes, rinse it and drain. These noodles are then ready to use in Asian or Italian dishes. 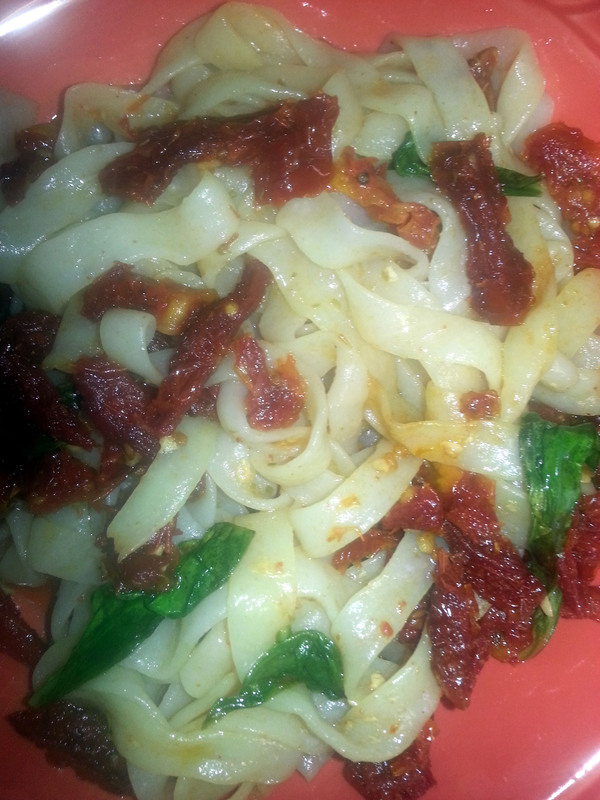 Pairing these noodles with sun-dried tomatoes and basil was the best thing I could have done. The Sicilian in me felt the comfort, but the health-conscious vegan felt light afterwards. Step 1: If using dry shirataki, prepare according to package before rinsing and draining. For wet shirataki, simply rinse and drain. Step 2: In a pan over medium heat, add Olive Oil, Garlic and Shirataki noodles. Stir. Step 3: Add salt, pepper and parmesan (optional). Stir. 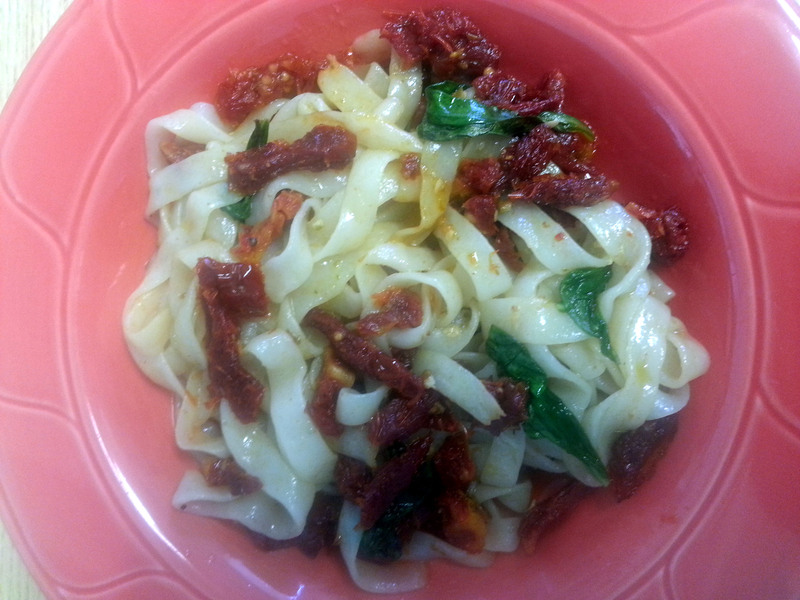 Step 4: Add Sun-Dried Tomatoes with its own oil and Basil. Stir. *Tip: Don’t over cook or burn. Shirataki only needs to be cooked for a minute or two. Make sure you add the ingredients quickly. *Serving Suggestion: A slice of sprouted bread compliments this dish perfectly. Enjoy!